John Hughes reports from Killygordon. 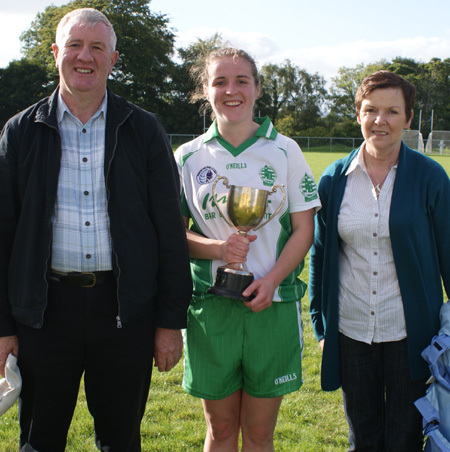 Aodh Ruadh picked up the intermediate title at the third time of asking with a strong and assured display against Malin in Killygordon. 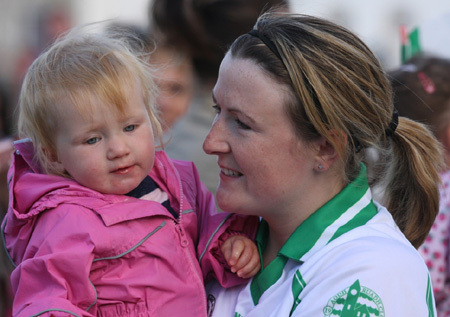 A tigerish performance from the Ballyshannon half backs, a sharper cutting edge in the forward line and the Ernesiders obvious hunger proved the main differences between the sides. 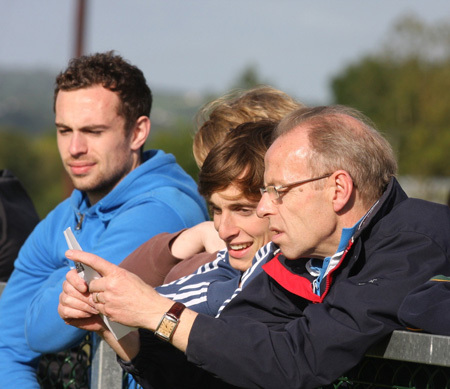 The ground at Killygordon was in great nick and there was a big support from Ballyshannon present. 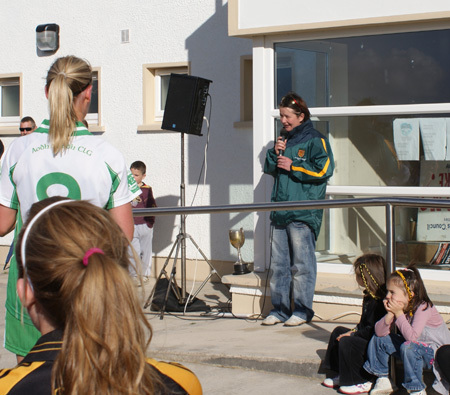 As the game threw in Aodh Ruadh played into a tight breeze, but that fell off shortly into the game and the sun came out to provide ideal conditions for football. 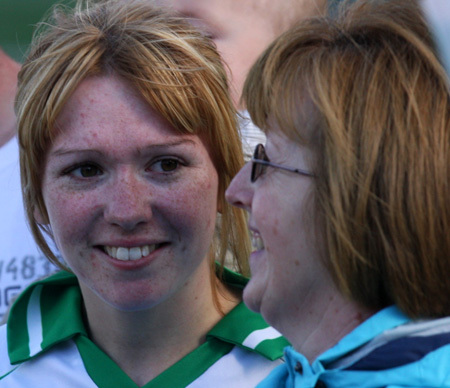 The green and white weren't long about getting down to business with Donna Martin pointing a free in the first minute. 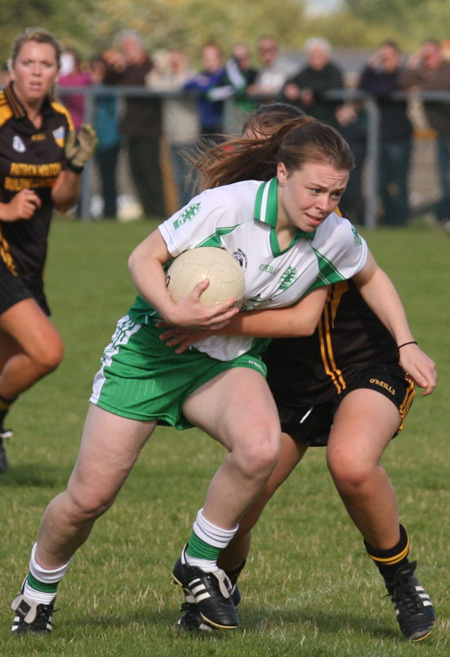 However there were some early nerves with Aodh Ruadh hitting two wides from Dorrian and Martin before Malin's star turn, Emma Donaghy picked off a fine point for the Inishowen side on six minutes. 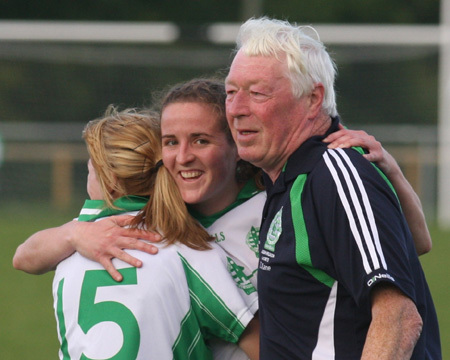 A couple of minutes late Malin doubled their advantage with a point from midfielder Rois�n McDonald. 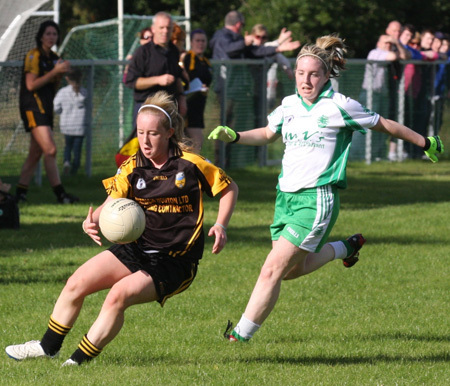 Donna Martin hit a shot off the post before pointing a close range free won by Elaine Dorrian. 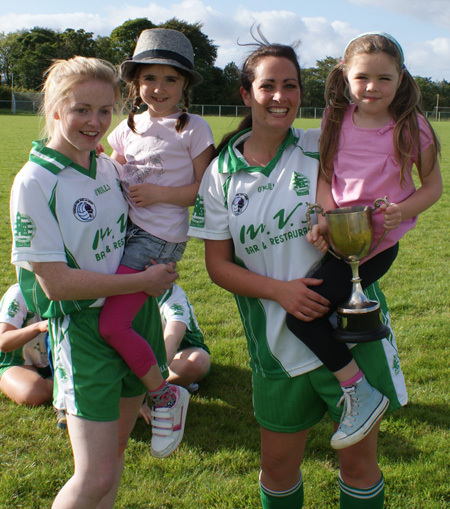 Dorrian had a fine game and Malin had a very difficult time trying to keep tabs the livewire. 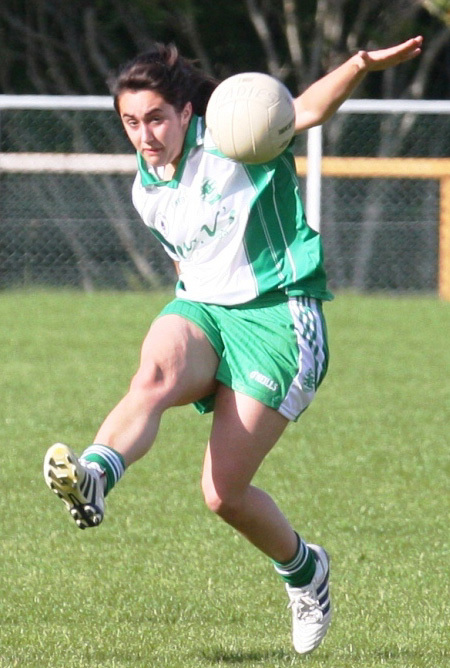 However it was the other livewire on the forward line, Anna Rafferty, who was next on to the score sheet to put Aodh Ruadh into a 14 minute lead that they held for the remainder of the game. 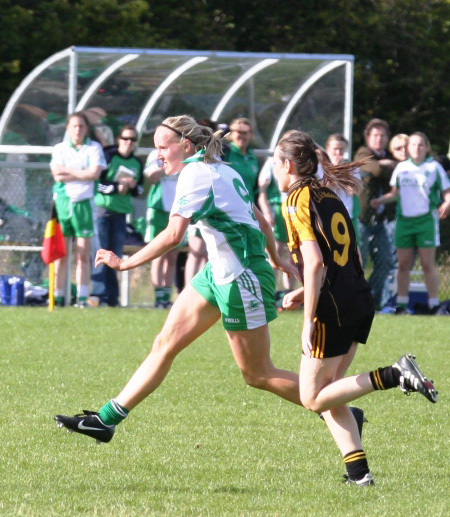 The sides exchanged wides before Dearbhaile McNeill fired over a beautiful left-footed point to make it double scores in favour of the Ernesiders on 21 minutes. Directly after that Anna Rafferty robbed a Malin defender on her way out with the ball finished clinically from close range. 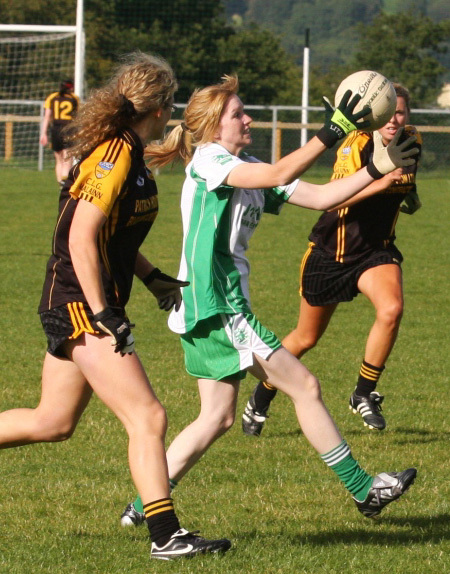 With five minutes left in the half and Aodh Ruadh continuing to dominate Elaine Dorrian had shot foot-blocked. The referee, who otherwise had an excellent game, opted not to give the clear penalty shout. In the scramble that followed the foot-block Dorrian bravely recovered the ball and drilled over. The point safely dispatched Dorrian finally went down for the required treatment on her injured foot. 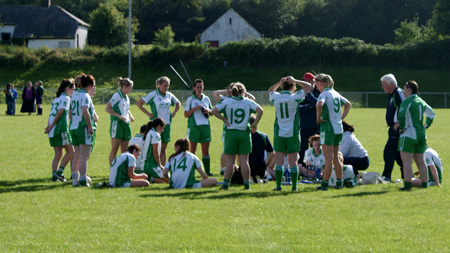 Five minutes injury time was played, but the remainder of the first half was all Aodh Ruadh. There was a wide and a Dorrian shot off the crossbar, but Dorrian was back a minute later with a superb point. 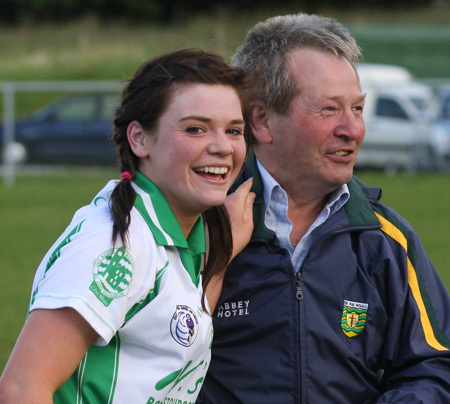 Emma McPhelim struck a wide before the rangy Dearbhaile McNeill notched her second point of the game to put two goals in it. 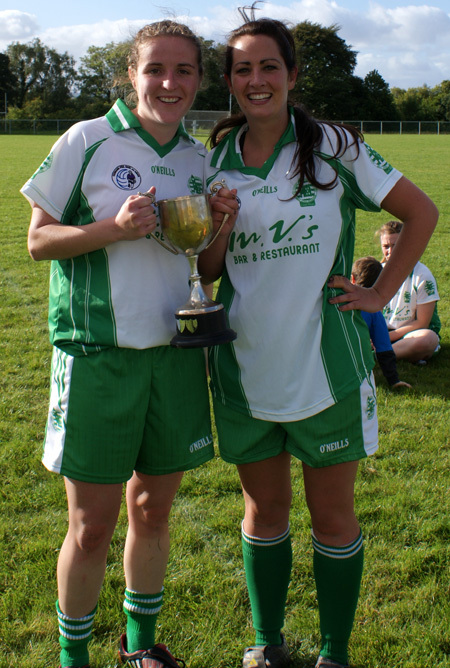 With 35 minutes on the clock Malin made it past the ferocious tackling of Tara Khan, Aoife Buggy and Annette Lloyd. 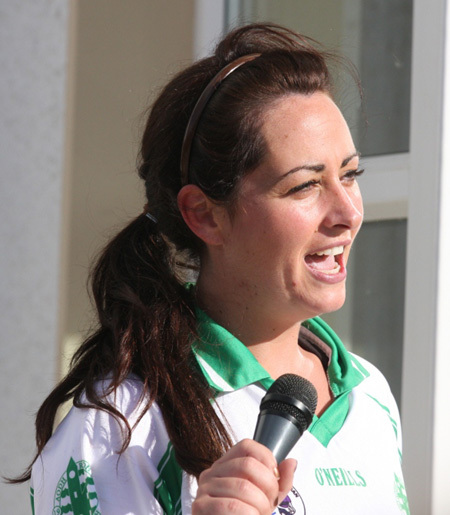 Emma Donaghy finished some good work with a point on to claw back a bit of ground for Malin before heading in for the break. 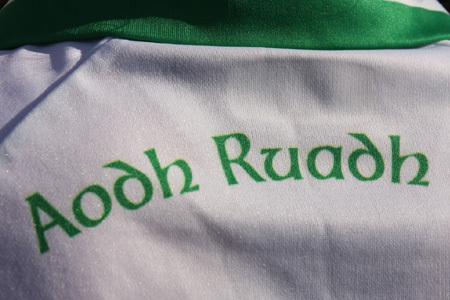 Half time score Aodh Ruadh 0-8 Malin 0-3. 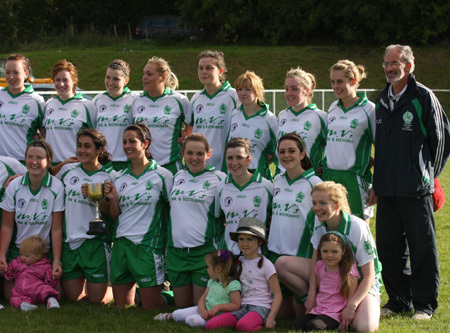 If anything Ballyshannon came out more assertive in the second half. 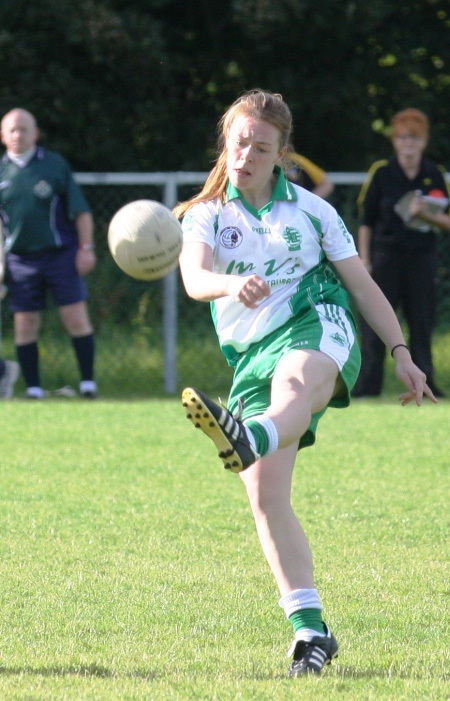 Sarah Patton seizing the ball from the throw-in, romping through the Malin defence and booming over a point that must have made ominous viewing for the Malin spectators in the crowd. 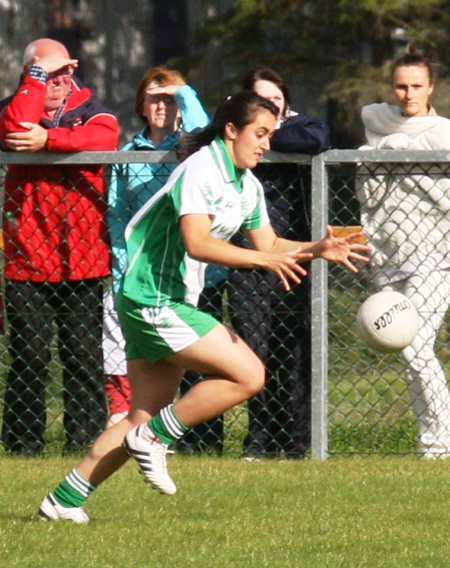 The Malin players weren't cowed though and Kayla Farren pulled back a point. 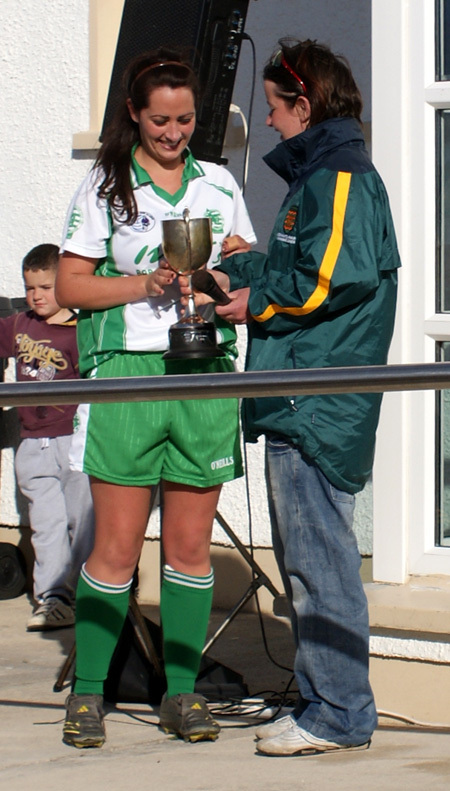 A superb Donna Martin free restored the two goal cushion on 34 minutes before the Inishowen side came raking up the field on the attack. 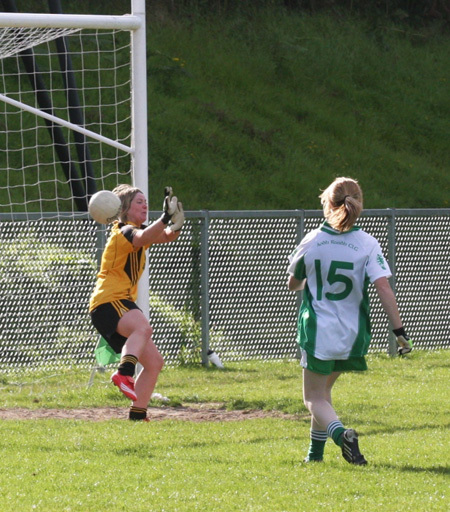 Emma Donaghy came onto the ball and hit a precise arcing goal into the top left corner of Marita Maguire's net. With a goal in it the next score was crucial. 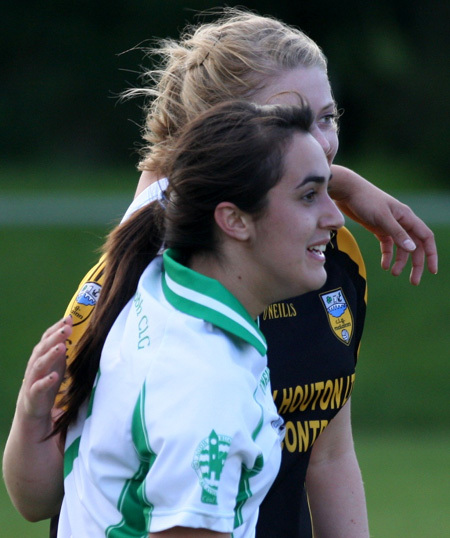 It fell to Aodh Ruadh on 40 minutes thanks to a sublime individual point from Anna Rafferty. 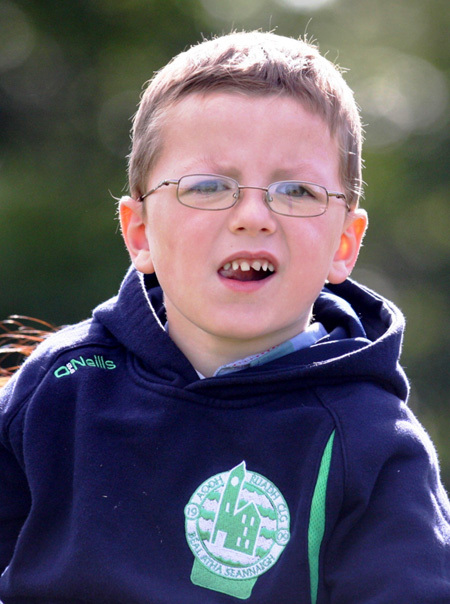 That inspirational score galvanised Aodh Ruadh and they owned the next 15 minutes. 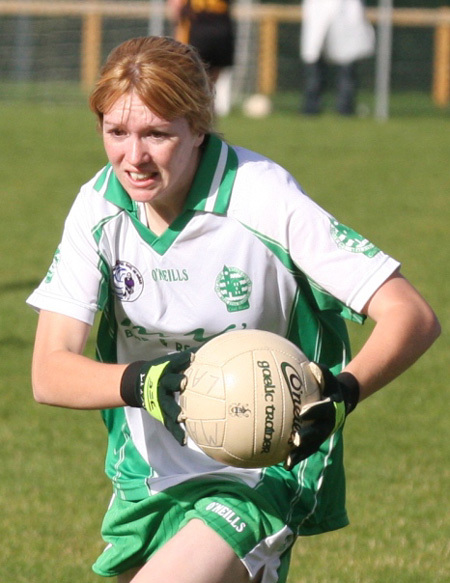 Dearbhaile McNeill took two points in a minute followed by a point from Elaine Dorrian to make it 0-14 to 1-4. 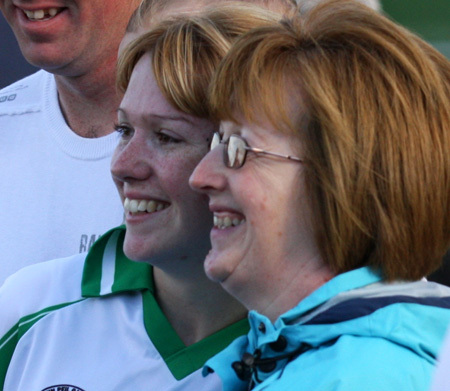 The killer blow came on 51 minutes when Tara Khan went on a rampaging up the wing, she fed Elaine Dorrian who jinked her way into the danger zone before unleashing an exocet of a shot from the left that flashed past Marie Houten in the Malin net to make the difference ten points. 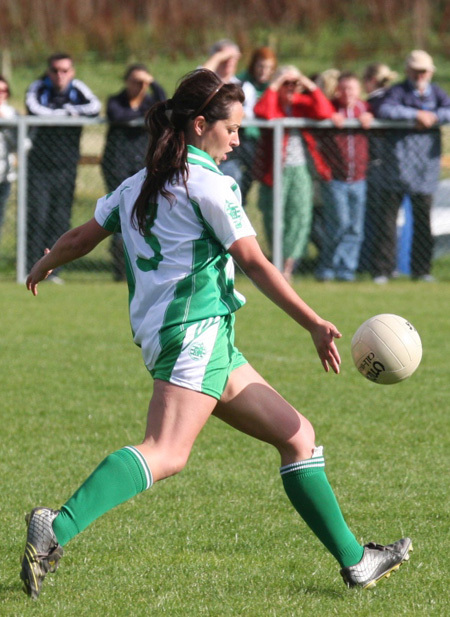 That hammer blow was compounded moments later when Sarah Patton collected the ball and drove through the Malin defence almost unchallenged and blasted the ball to the back of the net. 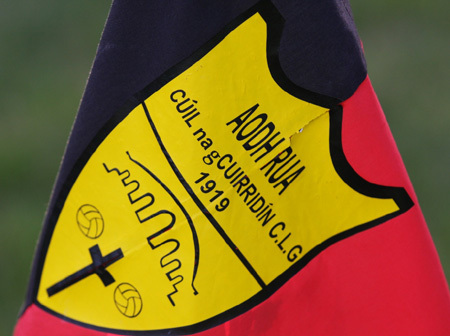 A minute late and with 56 minutes gone Malin won a penalty after Aodh Ruadh substitute Clare Breslin was adjudged to have handled the ball on the ground in the small square. 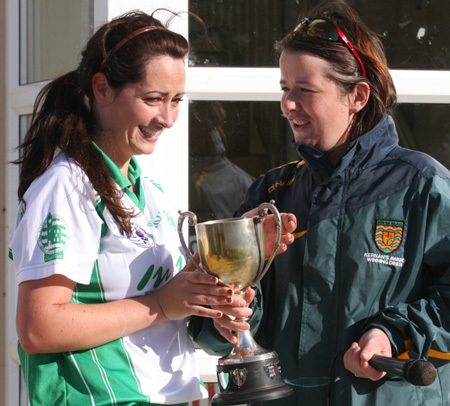 Malin's player of the match, Emma Donaghy, gave Marita Maguire no chance with her calm drilled shot to the left post. That left scores at 2-14 to 2-4, and Malin's number 18 added another point to give the Inishowen side the faintest of lifelines with two minutes to go. It was going to be Aodh Ruadh's day though. 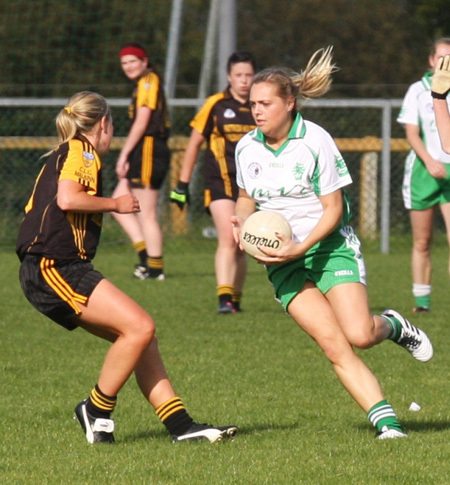 On the stroke of full time Sarah Patton scorched her way through the Malin defence again before off-loading to Dearbhaile McNeill. McNeill deserved a goal for her days work, but her driven effort shot just over the bar to finish the scoring at 2-15 to 2-5. 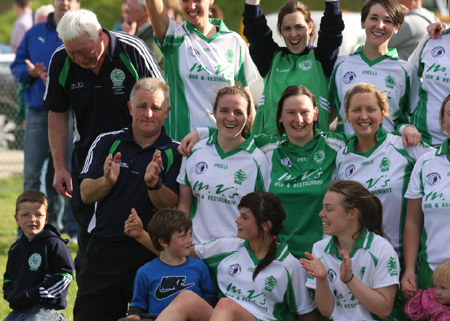 There was great jubilation at the final whistle as the Aodh Ruadh players savoured finally reaching the Promised Land. 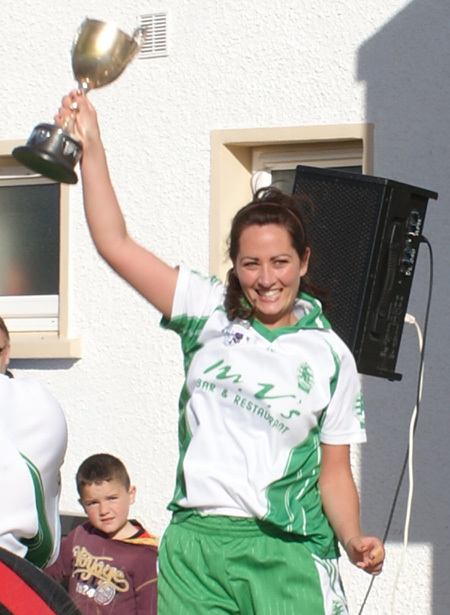 Captain Niamh Gallagher took delivery of the intermediate trophy before making a very magnanimous speech saluting the effort of the Malin players. It was a hard-earned, professionally executed and richly deserved win by a well-drilled outfit. The celebrations will last for a while yet, but manager, Terence McShea, believes the team has more to achieve and for him the focus has already turned to Ulster. 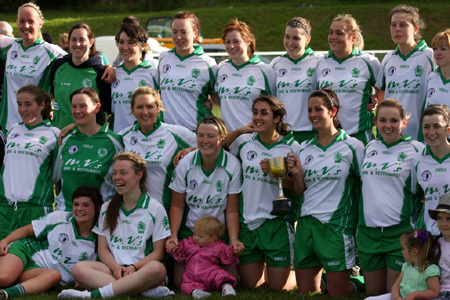 Marita Maguire; Catherine Lloyd, Niamh Gallagher (captain), Grainne McCosker; Aoife Buggy, Annette Lloyd, Tara Khan; Sarah Patton (1-3), Tanya O'Shea; Marita Leonard, Donna Martin (0-3f), Emma McPhelim; Anna Rafferty (0-3), Dearbhaile McNeill (0-5), Elaine Dorrian (1-3). 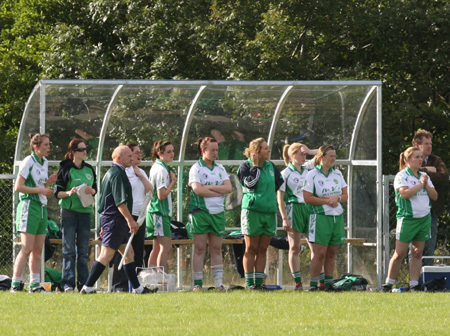 Substitutes: Clare Breslin for Catherine Lloyd (46 minutes), Donna Rogers for Marita Leonard (58 minutes), Katie Flood, Finnoula Gill, Grainne Gillespie, Andrea Rogers, Lorraine Roper, Ciara Buggy, Jessica McGarrigle. 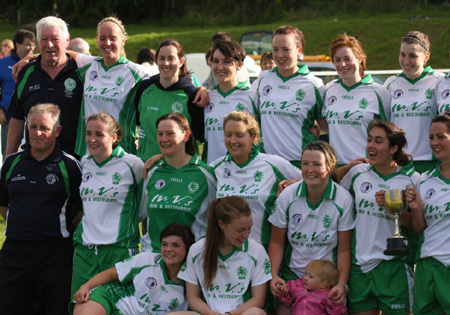 Marie Houten; Dereena Houten, Ciara Walsh, Denise McCarron; Caroline Kelly, AN Other (0-1), Mareen Collins; Roisin McDonald (0-1), Linda McColgan; Michelle Doherty, Lorraine Logan, Emma Donaghey (2-2, 1pen); Maria McLaughlin, Emer Lafferty, Kayla Farren (0-1). 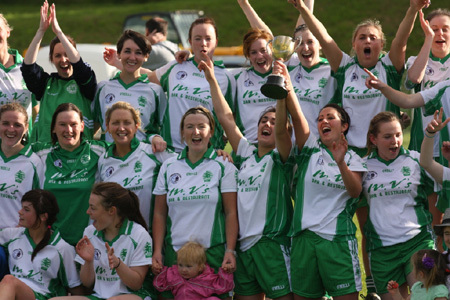 Substitutes: Anne Lafferty, Caroline Glackin, Catherine Smyth, Fron Monagle, Frances McDonald, Grainne Byrne, Joanne McKinney, Kate Kelly, Keara Kelly, Lorna Houten, Marion O'Donnell, Megan Doherty, Naomi McLaughlin, Tara Farren.